Highlights: Freshmen year starting Pitcher. Seven starts and 1 relief appearance. Pitched 44 innings as a Freshman, 3rd highest on the team. Has accepted a scholarship to pitch for UW – Parkside this coming Fall, 2013. 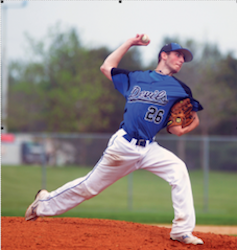 The 2013 Division III NJCAA has named Joe one of the top 50 returning pitchers in the nation. He was one of 8 pitchers from his region and 1 of 3 from his school. This entry was posted in 2011, Athletic Alumni by Communications Department. Bookmark the permalink.